Does America need (or want) a compact pickup again? Chevrolet showed pics of its next-generation Colorado pickup concept, a compact-like pickup to take on the Ford Ranger. No, not the Ford Ranger that we get in the U.S., but the next generation Ranger everyone gets but us in the U.S. Granted, there hasn't been official word whether or not we'll get the Colorado replacement, it brings up a question: Does America need a compact pickup again? It wasn't too long ago when Chevrolet, Ford, Mazda, Mitsubishi, Nissan, and Toyota all offered a rather small pickup. However, over the years those models either got bigger or disappeared. 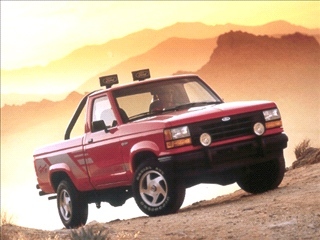 Ford still sells the Ranger, but it's slated for the graveyard (even though it recently outsold its own Mustang lineup). Chevrolet/GMC still sells a smaller-than-fullsize pickup (technically a midsize), the Colorado and Canyon, respectively. Toyota sells the Tacoma. However, none are really that small (or that efficient), and are now typically classified as the aforementioned midsized truck. Critics will argue that small pickups don't sell, and will point to the lack of market share. However, much like the subcompact market before around 2001, if there aren't any (or many) options, how are they expected to sell well? I'm not arguing a case for the tiny Kei trucks, merely something smaller than the current midsized offerings. Pickups are a part of the American landscape, and they're here to stay. However, would a genuine small truck sell here in the U.S., or do consumer want big trucks only? The new Chevy looks like the Honda Ridgeline hooked up with an Aveo! I for one want a new compact truck. Gas is going up. And even with an ecoboost, mileage won't be that super in the full-sized trucks. America needs to sell (in the US) a compact diesel truck. I'd buy it in a heartbeat. Oh and to be a grammar jerk, it's "none is" not "none are." I can't leave my '85 Toyota yard truck parked too near the road without attracting offers! At 30 mpg and with a long bed, it serves my needs as it has since new. How many people have big trucks that eat gas and never do much truck work? If I have to make a second trip to complete a haul, I am still dollars ahead over the years. And I can count on one hand the number of second trips I have ever made, none over an hour. If people bought what they actually need, there would be many many compact trucks around. You don't see these sitting around with "For Sale" signs on them. They get snapped up immediately. If you are going to be a jerk... at least make sure you are correct - which you aren't. Now you are just a dumb jerk, rather than a "clever" jerk.